Full disclosure, I was provided a copy of this book by the author, however, have voluntarily chosen to write a review. All opinions are my own. The Secret of the Lost Pharaoh is scheduled for an April 17,2018 release. 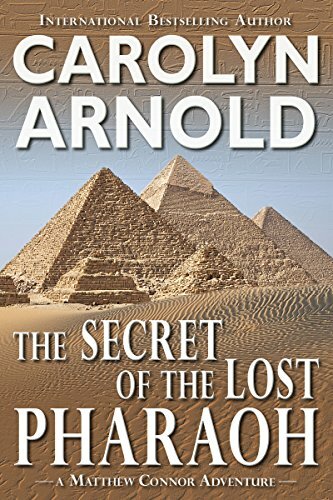 The Secret of the Lost Pharaoh is the second in the Matthew Connor series of books by author Carolyn Arnold. Matthew, a renown archaeologist known in certain circles as “The Legend Hunter”, is contacted by a colleague currently working on a dig in Egypt. Having possibly discovered the tomb of a nameless pharaoh, Alex seeks Matthew’s expertise to join her in what may end up being the discovery of the fabled Emerald Tablets. Not willing to pass up the opportunity of a lifetime that would solidify his reputation, Matthew invites his best friends to tag along for the adventure. With the exploration fraught with mishap and mystery and amid whispers about “curses”, Matthew begins to wonder if his Legend Hunter moniker is worth the damage that could result if the tablets fell into the wrong hands. When I was first contacted to read and review The Secret of the Lost Pharaoh, I was immediately intrigued. Ancient Egypt, mummies, treasure, and curses have always been a fascination of mine, so I jumped at the opportunity to request an early copy. The detail with which the dig site, underground catacombs, burial chamber and subsequent riches were described made me feel as if I were standing next to Matthew and Cal as part of the team. I was a little concerned with this being the second book in the series that there would be gaps in the story or the characters because I had not yet read City of Gold. I needn’t have worried, however, as Arnold has crafted her narrative to focus on the present adventure. Don’t get me wrong, the team’s previous exploits are still mentioned in the context of the story, but with just the right amount of filler. At no time did I feel lost or left out of an inside joke because of a plot hole. If you like action-packed adventure books that’s that will keep you reading well into the wee hours, I would recommend The Secret of the Lost Pharaoh. After this introduction to the Matthew Connor series, I am considering picking up a copy of City of Gold, as well as any future books in the series. Thank you for reading and reviewing THE SECRET OF THE LOST PHARAOH. Your support is appreciated.